If you guys are tuning in now on our trip to Korea, check out what we did on our first week there on Ganghwa Island! 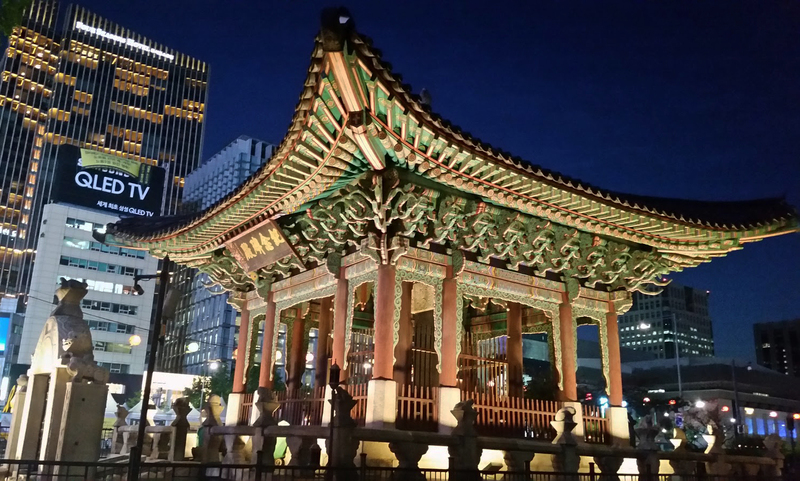 Namdaemun Market (남대문 시장 – Great Southern Gate Market) is known for kitchenwares, housewares, arts and crafts, souvenirs, electronics, clothing, and food. 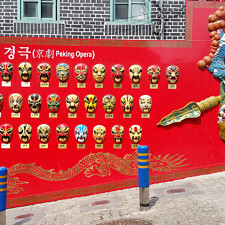 This entire area is known to be open around the clock, with plenty of places to shop, and stores often filled with hard-to-find items. My mom wanted to buy some food storage containers and dried leafy vegetables, so we went to the market with that in mind. 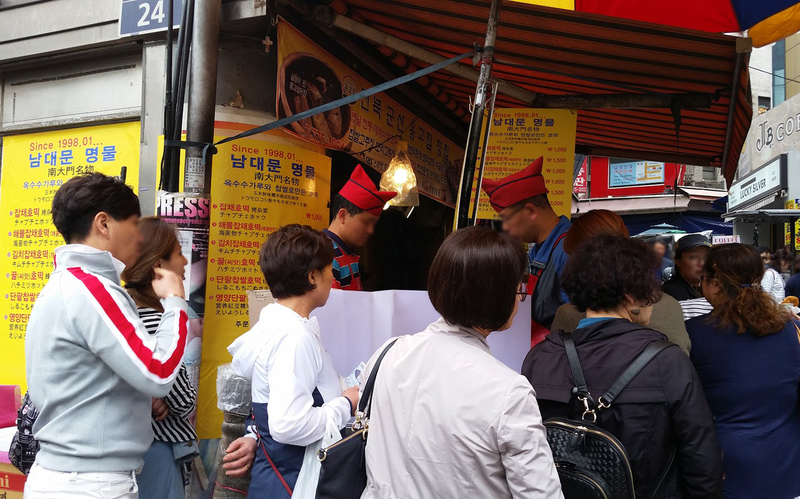 While we were there, we bought some souvenirs for my mom’s friends, and ate some more hotteok! What’s unique about this pancake place is that they specialize in savory stuffed pancakes. My cousin decided to join us on this day, and knew exactly where to take us for this tasty treat! 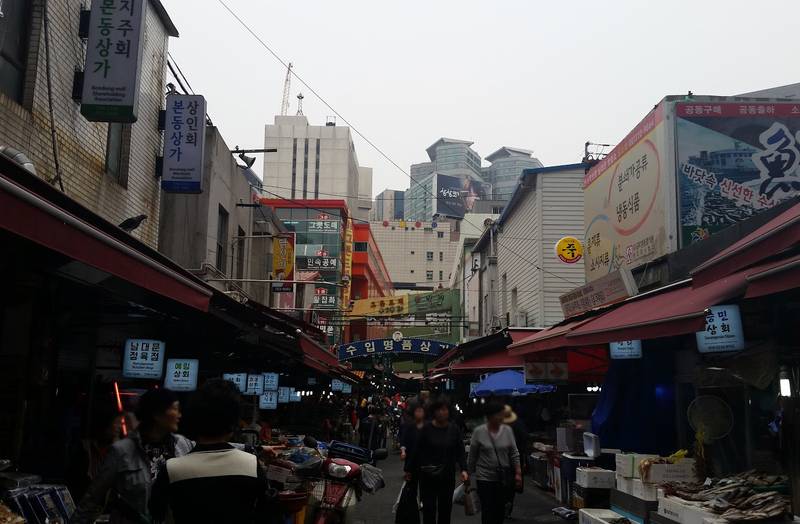 Here’s a wideshot of one of the many alleyways around Namdaemun. 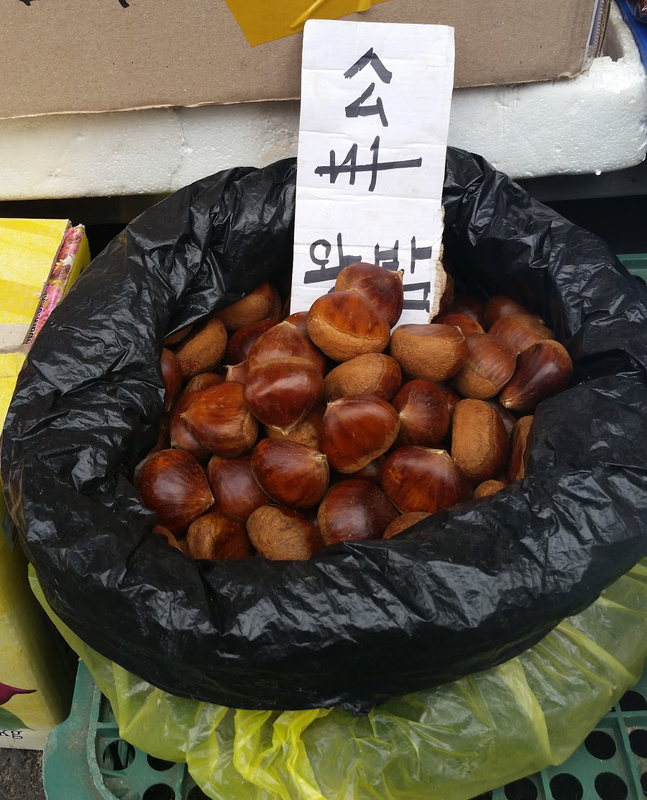 Those chestnuts are huge! They looked so yummy!! We were tempted to buy some. 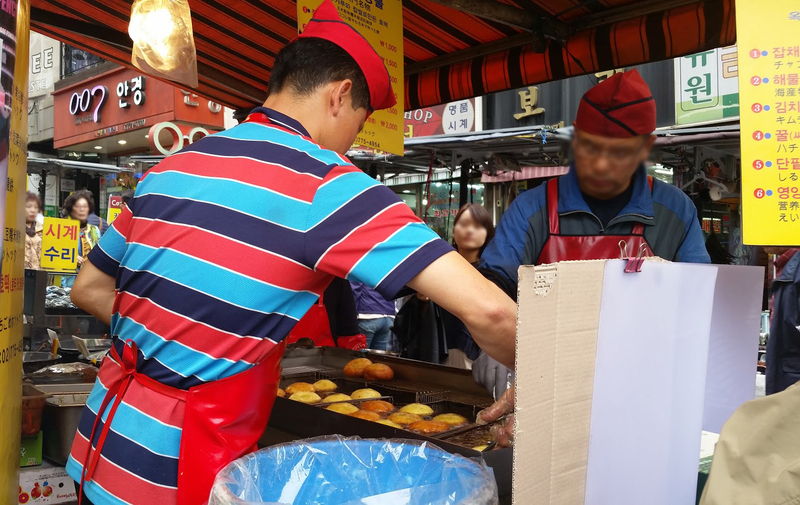 This is that special Hotteok place! We looked over the menu and decided on getting a variety. Here are the two men working on those corn flour and sweet rice pancakes. The line was long, but we didn’t mind waiting. We knew that with this many people, the food must be tasty. Clockwise from top left: honey, seafood japchae, kimchi japchae, japchae. They were piping hot and *so* appetizing! 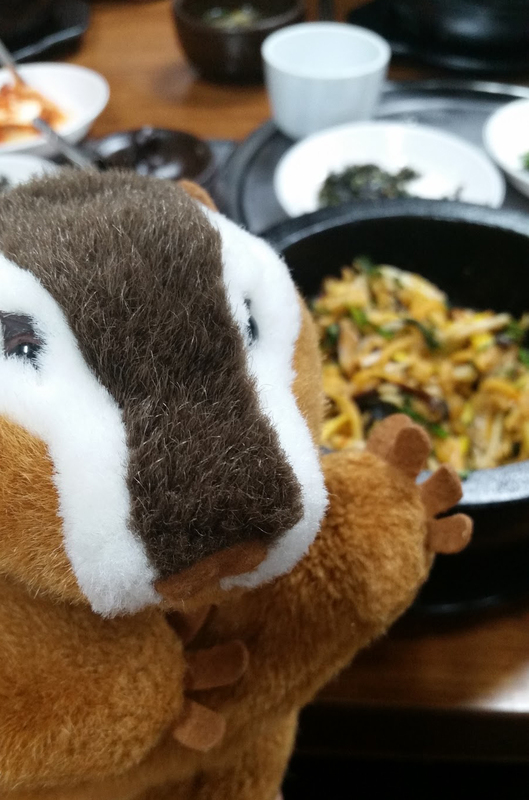 The seafood japchae was slightly spicy, which made James quite happy; however, this was only a light snack. We made our way back into the market area (the pancake stall was located off a busy street, possibly on the outer edge of the market), enjoying our pancakes, passing a bunch of food stalls (some delicious looking jokbal along the street, and other savory delights), and picking up some of my mom’s items from her list. 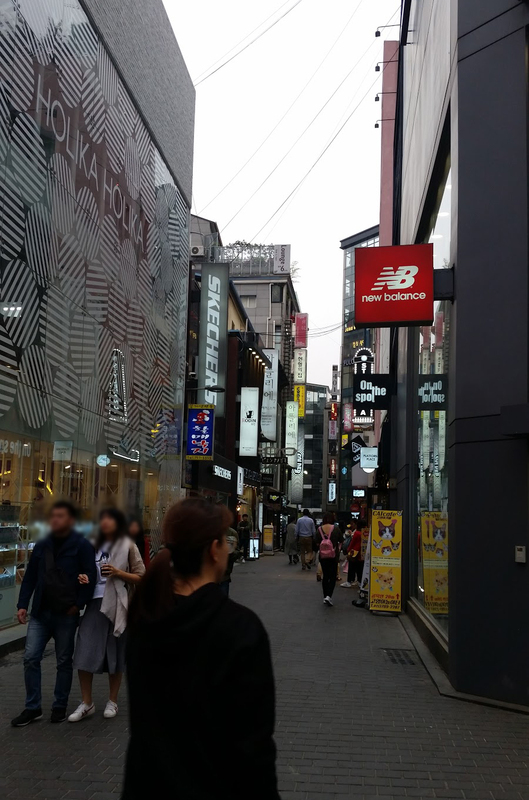 We then slowly walked to Myeongdong (명동), a shopping and touristy area. 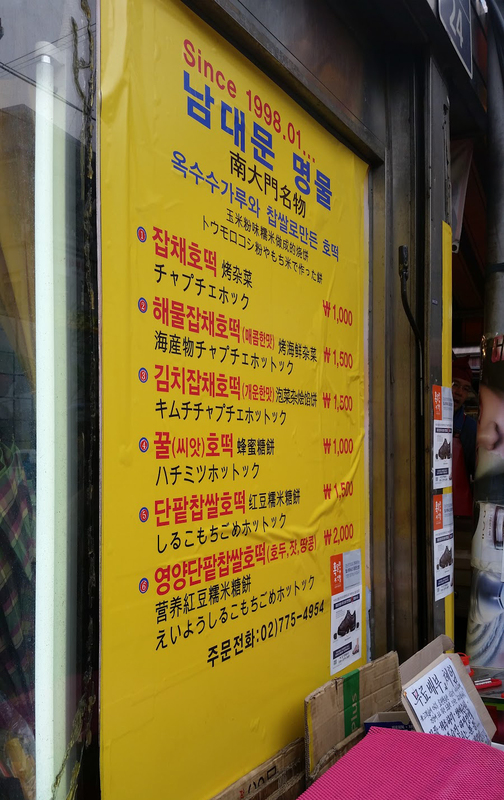 Before walking along the narrow streets of Myeongdong, we dropped into a restaurant to eat a proper lunch. We all ordered bibimbap! 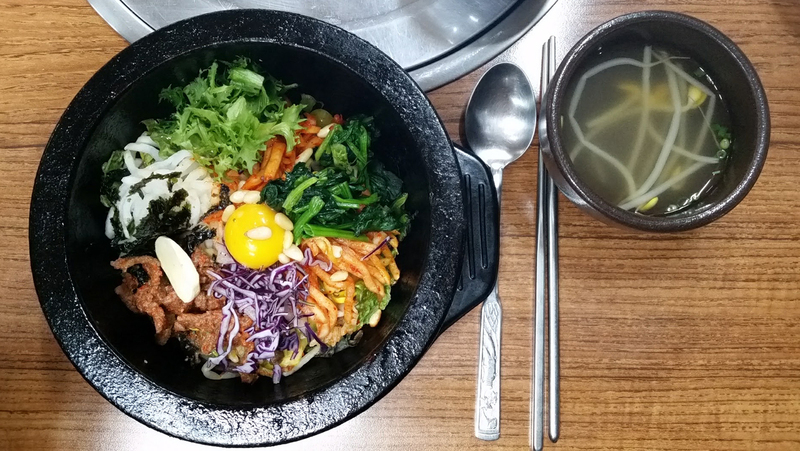 Our bibimbap lunch! This bowl contained chestnut, gingko, and pine nuts, something that was unique for us. This is Brigitte, aka Chippie. She’s my traveling chipmunk. She’s enjoying our lunch too! 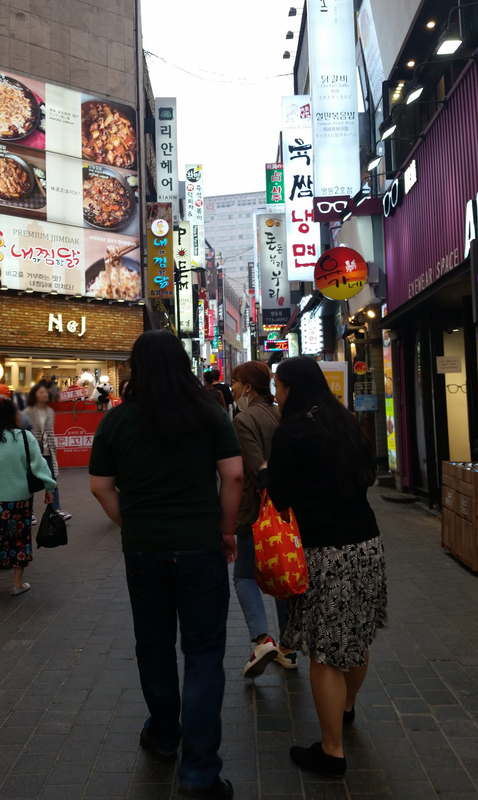 We finished our lunch and decided to walk around the shopping district. We came upon some dog and cat cafés, lots of clothing stores, and a store called Artbox. We were in that store for over an hour, looking at cute character stationery, plushies, home goods, souvenirs, toys, and accessories. We also walked into the Line Store, another character-related shop that’s all about the characters from the phone app. I bought a Hello Kitty phone cover while walking around the many shops, and a pink bunny plushie at Artbox. Yep! That’s us! Kitty on the left, Bunny on the right, and my cousin in front of us. 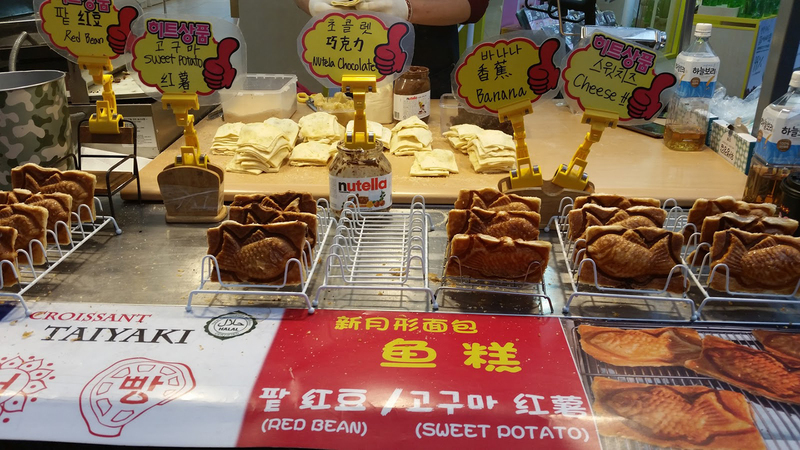 As we walked along the streets, we found a bunch of food vendors selling a variety of snacks. 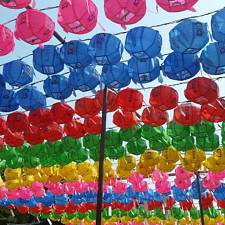 We found these boonguh bbang (붕어빵) (Yes! 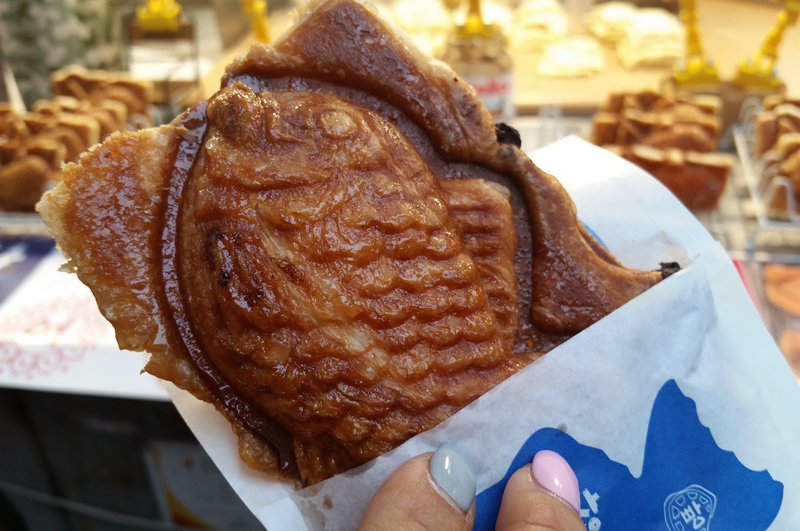 More fish-shaped bread! 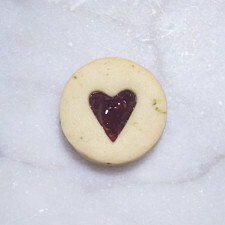 ), but these were made using croissant dough! We just had to stop and try one of these! 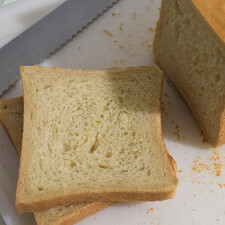 Crispy, crunchy, and sweet! 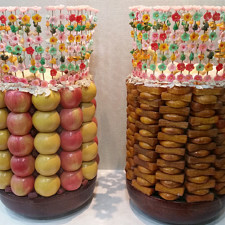 They were absolutely heavenly! 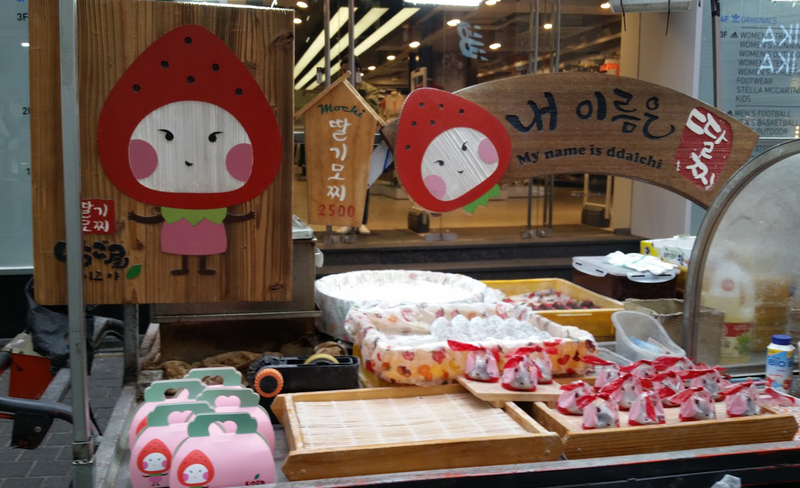 Here is a mochi vendor that sells rice cakes filled with fresh strawberries. 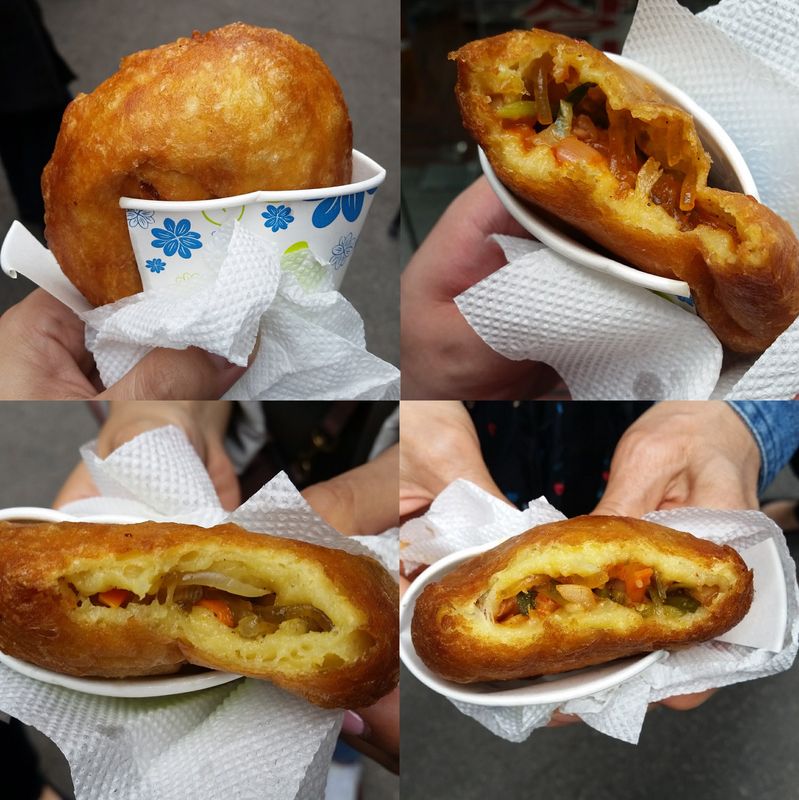 This vendor makes Japanese-style savory cabbage pancakes, called okonomiyaki. I’m guessing that the sign on his cart is missing a couple vowels. 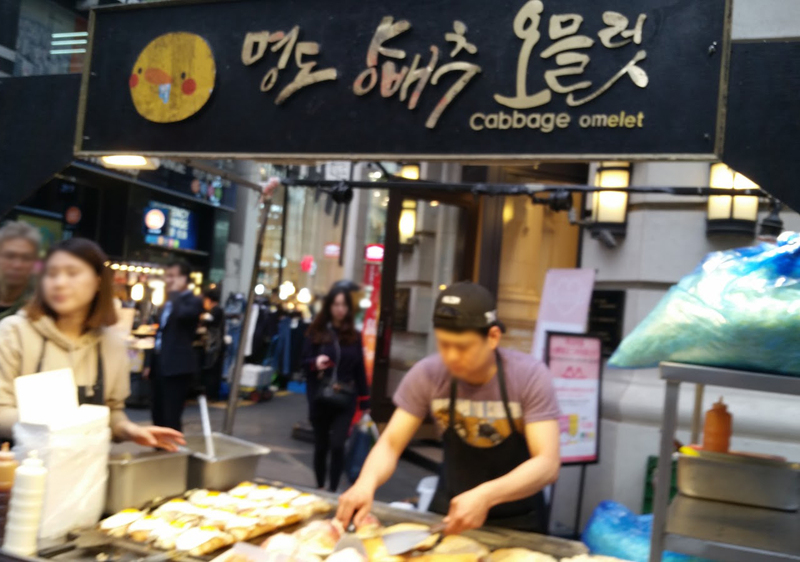 It should read ‘명동 양배추 오믈렛’ (Myeongdong Cabbage Omelette). 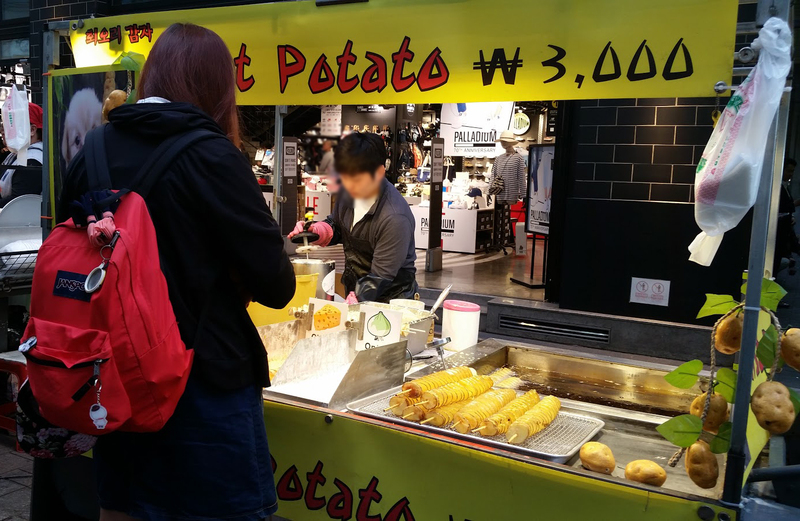 These spiraled potatoes were everywhere! They looked good, but we were all busy eating our croissant fish-bread. We couldn’t help but take this photo. We were surprised that James had a pizza company! 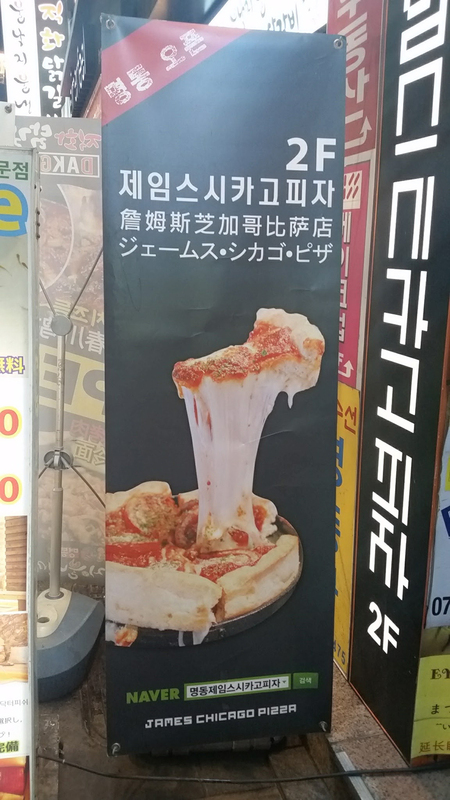 All kidding aside, we were curious about what Chicago-style pizza tastes like in Korea. It’s on our list of things to eat when we go again next time! 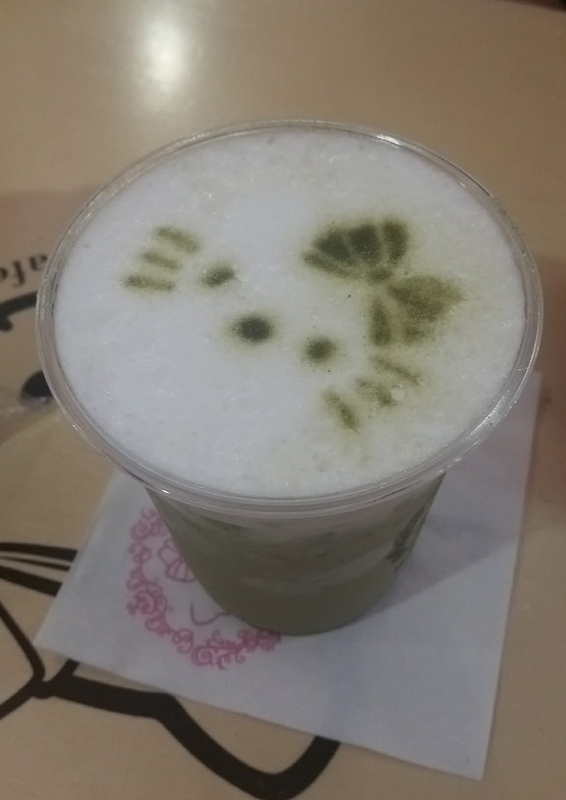 At the end of our day, with our feet a little tired, we found a Hello Kitty Café in Myeongdong. 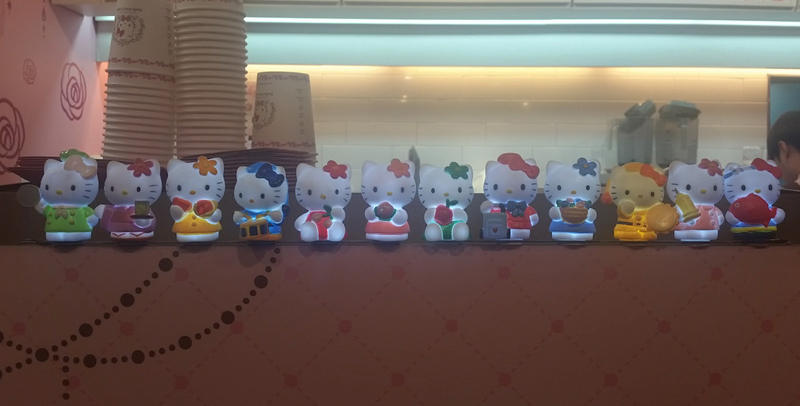 We couldn’t believe we ran into one, so we *had* to go and sit with Hello Kitty! When we entered the café, there was a string of lights along the coffee station. So adorable! 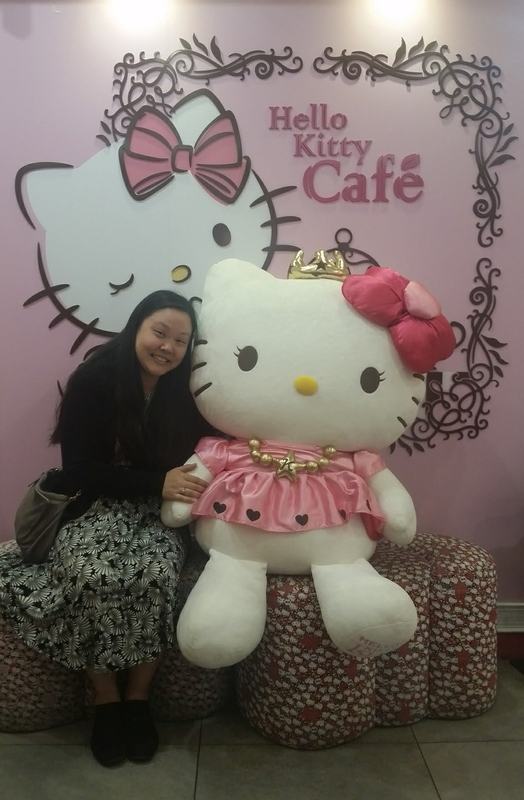 Here I am with Hello Kitty!! My life is complete! 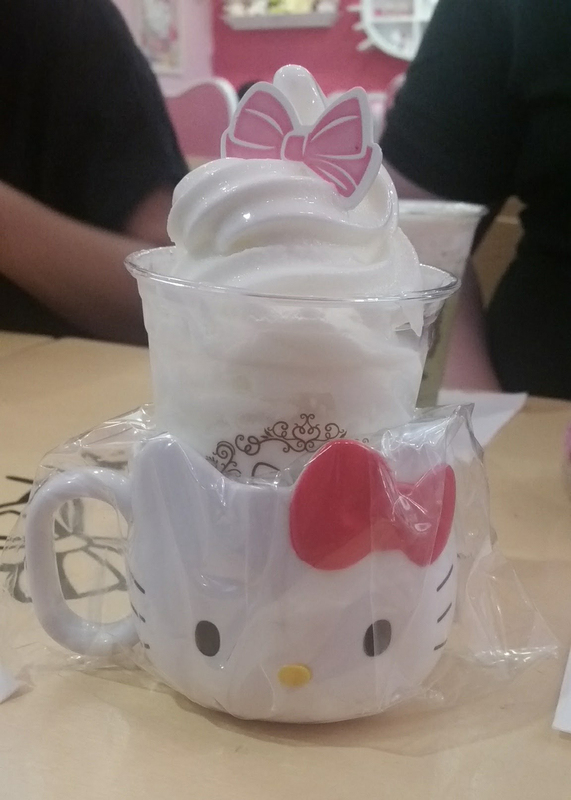 I ordered a soft serve in a Hello Kitty cup! James got a green tea latte! 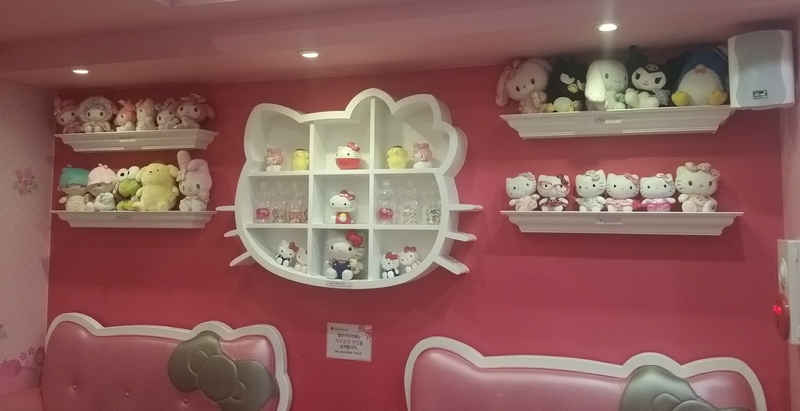 The entire café was pink and decked out with Sanrio characters everywhere. We had the space to ourselves, so we relaxed and savored our treats. 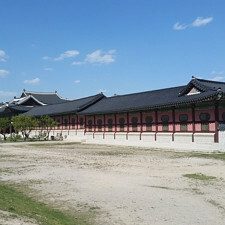 After resting our legs, we ventured home to recuperate and continue onto our next adventure: Tongin Market, Gyeongbokgung, Bukchon Hanok Village, and Kyobo Bookstore by Gwanghwamun. 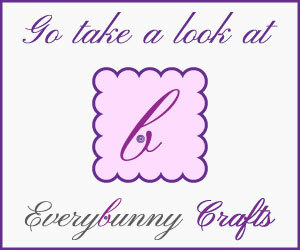 Stay tuned for our next installment! 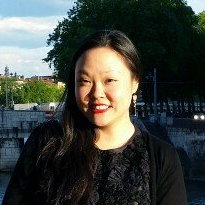 Loved your market tour pictures and your hello kitty picture!